In between Brexit and overdoing the hygge, the ever-misguided British people have been serving themselves hot lashings of ‘Nordic Matters‘, a year-long culture fest in 2017 dedicated to the five countries and numerous semi-autonomous, rocky islands to their north. 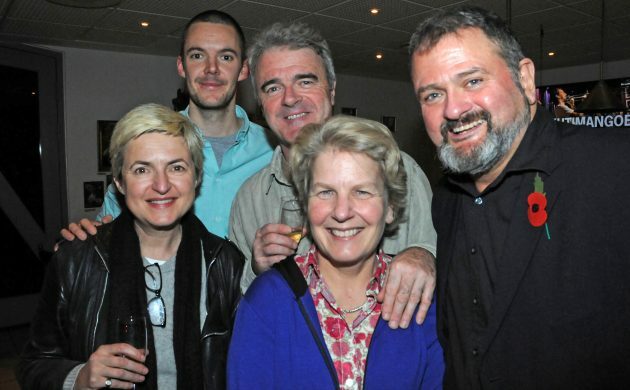 And it was at one of its events recently, ‘Dane Sandi Toksvig’s Mirth Control Goes Nordic’, where the Danish comedian and writer was presented with the Confederation of Scandinavian Studies (CoScan) International Award for 2017. We’ll have to take CoScan’s word for it that this is a “renowned” and “prestigious” award. According to its website, the last recipient was back in 2011, and there’s no explanation as to whether the sequence of winners since the inaugural selection in 1994 (Lillehammer – the town not the TV series) is random or down to there being very few Nordics worthy of winning. Other winners of the award include Swedish tennis player Stefan Edberg and football manager Sven-Göran Eriksson, Finnish motor racing champ Mika Häkkinen and, err, the Øresund Consortium for building ‘The Bridge’. In fact, Toksvig is Denmark’s first victory without the help of a neighbour. In contrast, recipients solely from Sweden and Norway have won it four and three times respectively. Toksvig’s show was part of the WOW (Women of the World) festival at the Southbank Centre’s Royal Festival Hall in London, which welcomed speakers and artists from across the Nordic region. CoScan president Mark Elliott made the presentation and started off by using the terms Nordic and Scandinavian interchangeably – not a promising start – before mentioning CoScan’s “excellent magazine”. “It runs in the family, having started with your father Claus – the celebrated Danish journalist, broadcaster and politician,” Elliott told Toksvig. Accepting the award, Toksvig said she was not deserving of being in the same company as an optical telescope and a structure “literally bridging the divide between two nations”. “All I have done is continue to be Danish and that’s easy. I am extremely proud of my heritage,” she said. She then ended proceedings with a tribute to her father with some words from the Danish poet and mathematician Piet Hein: “Den som kun tar spøg for spøg og alvor kun alvorligt, han og hun har faktisk fattet begge dele dårligt” (those who take humour only humorously and the serious only seriously have frankly understood neither).